I always stare at the herbs and spices in the grocery store and marvel at how expensive they are: $6, $7, $8 for tiny little jars. I even sometimes wondered about how to dry garden herbs. Then I started buying spices from the bulk bins and found it significantly less expensive. But this summer we had a bumper herb crop and while I used the fresh herbs in recipes, I was thinking I really should figure out how to dry garden herbs so I have herbs all year! It’s really simple to dry rosemary and thyme. We have plenty in our garden and those are my favorites to dry. I may even package them up in pretty jars and gift them at Christmas! 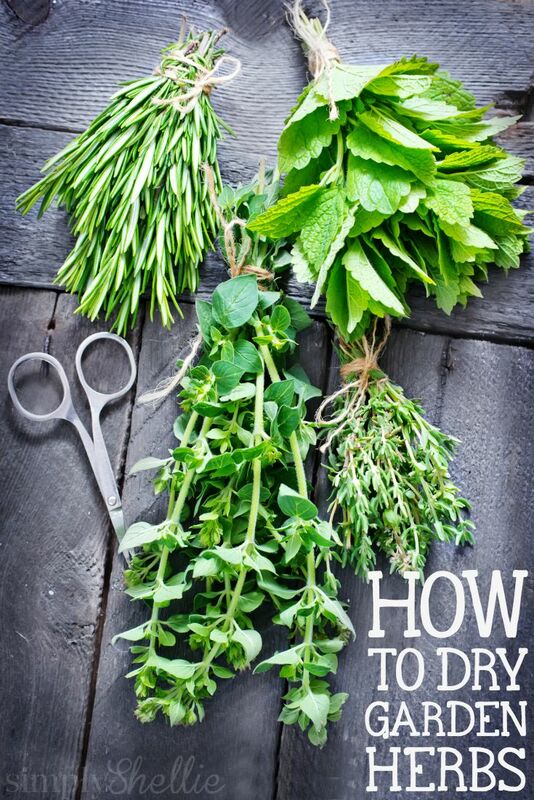 So here’s a step-by-step guide for How to Dry Garden Herbs. For your first time I think it would be best to pick herbs that have low moisture. These are the easiest herbs to dry. You likely have several in your herb garden already: rosemary, thyme, tarragon, dill, oregano and sage. Other herbs are trickier because they are more sensitive to moisture and might turn moldy if not dried quickly enough. Higher moisture herbs include basil, parsley, chives and mint. Cut your herbs mid-morning after the morning dew has dried but before the afternoon heat. The sun can evaporate the oils in the herbs so it’s best to cut them in the morning when they are fresh. If you need to rinse the herbs, do so gently with cool water. Use the least amount of water possible and very gently pat them dry. Inspect the leaves and remove any with bruising or blemishes. 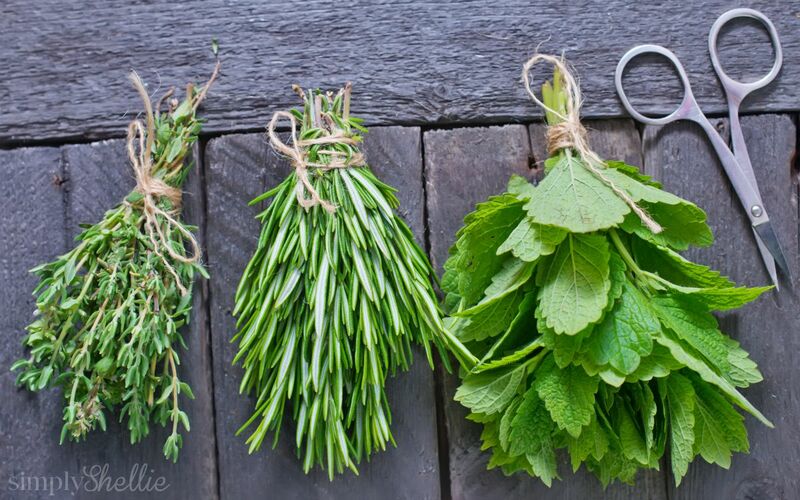 For the low-moisture herbs like rosemary, thyme and sage the process is super easy! Gather 5-10 branches together and tie them with string. I like to use more like 5 branches because the smaller the bundle, the faster they will dry. After you bundle them, put the herbs inside a brown paper lunch sack and tie the end closed. Using the brown paper sack can speed up the drying process and it helps catch falling seeds and leaves. If you’d rather just hang them out in the open, that’s okay too. It just might take longer for them to dry. Hang your herbs away from direct sunlight but in a warm, dry room. The drying process can take anywhere from 1-3 weeks depending on your herbs, your drying conditions and how large a bunch you are drying. If you have herbs that are higher in moisture, like basil and chines, you will want to dry them in your oven to prevent them from molding. Set the over to the lowest temperature it will go. Arrange the herbs on a baking sheet lines with parchment paper. Place the baking sheet on the very bottom rack, furthest from the heating element. Leave the door open. Turn the herbs frequently so the drying is even. When you can no longer feel any moisture in your herbs and they become crisp, they are ready to go! Use a mortar and pestle to grind them. Or they may crumble easily on their own. Store in spice jars like these and use when you run out of fresh spices. See! Super simple. We usually have rosemary year round so I guess I really don’t need to dry it. However, I like to have it on hand for those days when it’s raining or I’m too lazy to go out and clip some. We have a bumper basil crop this year though and it will likely be lost when it freezes so I’ll just have to start doing that in the oven once it cools off a bit! Don’t have an herb garden? It’s super easy to get one started right in your kitchen. You don’t even need outdoor space. Herbs do well in pots. 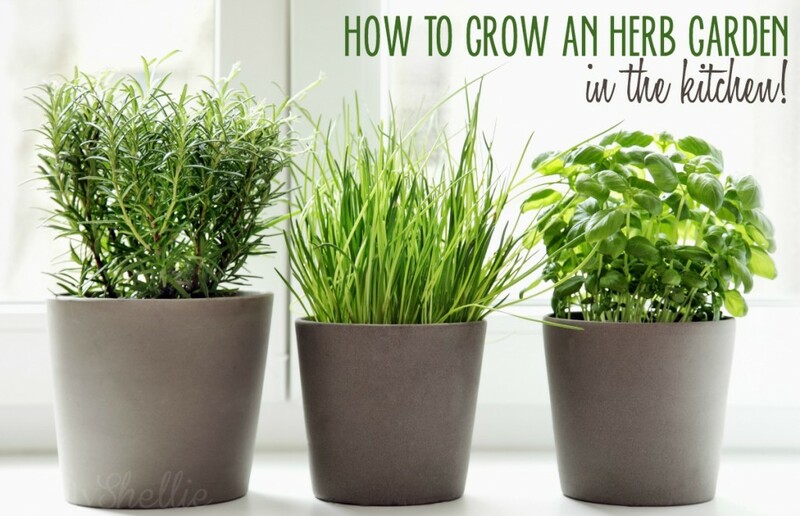 Check out my posts here with 5 Ways to Grow and Herb Garden in the Kitchen! Also, be sure to Follow Me on Pinterest and checkout my Outdoor board! This was very informative! I had always wondered how to do this but never actually followed through with looking it up. Thank you for doing all the hard work for me! Did your drying experience work out well? Great tips! My herb garden is going crazy right now. I really need to get some dried before it is too late! Is that Lemon Balm in the photo above or mint? I did not know about the low moisture vs. the high moisture. Couldn’t understand why my basil never really turned out. Thank you.